TED talks are passe, TEDx events are small potatoes, and TED-ED hasn’t really taken off yet. So why not create your own Fantasy TED Talk? Well, you can at least visualize your own ideal fictionalized TED Talk with the help of a few images and your favorite image editing software (like Photoshop or GIMP). Created as a ds106 visual assignment, making your own fantasy TED Talk can be as comical or solemn as you want it to be. The idea for this freshly created ds106 visual assignment came from a rather interesting take on TED Talks by cosplay artist and photographer David Dorn. For those not in the know, cosplay is the Halloween-like ritual of dressing up as your favorite cartoon, movie, video game, comic, or other fictional character while at a large convention or gathering to show your “fandom” for your fiction in much the same way “cheeseheads” and other sports fans paint and dress themselves in support of their team. 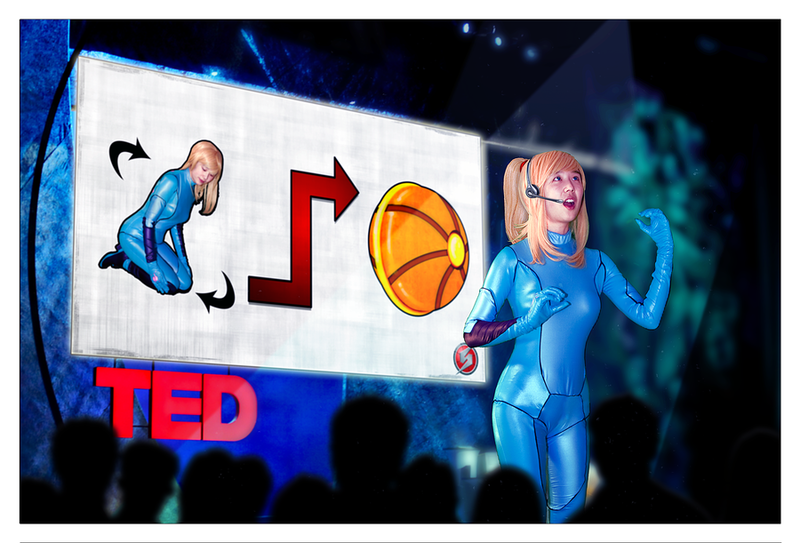 David created a fictional TED Talk as delivered by Samus Aran, the heroine of the Metroid video game franchise. Apparently, she’s espousing on the revolutionary ability to turn oneself into a ball for more energy efficient and protective travel. The original creation by David was marked with a Creative Commons license, encouraging people to share. However, he restricted his artwork with a “no derivatives” license, so I had to create a completely new one from scratch rather than simply Photoshop over his, which was a great experience as I learned how to turn any image into a black and white version in Photoshop, and broke the rust loose on my clone stamping skills (although they are still very rusty). I choose The Big Lebowski because I figured it would have a pretty comical effect on the whole TED Talk script, which is usually to pontificate on some mind-blowing, yet startlingly simple truth that has the potential to change the world for the better. The first few TED Talks I watched were quite inspirational, but after watching a half dozen or so, I became a bit dissullusioned with them. Platforms for motivational speakers are typically in good supply, and when good intentions start becoming derailed by corporate money (Bill Gates HUGE support for Khan Academy), it takes the magical “I could be next” feeling out of the lectures, and starts me to looking in other places for inspiration. This assignment doesn’t necessarily have to be used for comedic purposes though. While “The Dude” lectures on about his “dudeness” and bowling, you could very well use something similar to this for students to create visual representations of important themes and settings from a narrative being read in class, or for students to highlight and single out an achievement of some famous mathematician, scientist, or poet that is being studied in class. The point of the TED Talk is to focus with laser-like accuracy on one profoundly articulate idea, and it serves as a great way for people to connect, relate, and understand many topics which would otherwise be much more complicated and convoluted. TED Talks have a tendency to strip away the complications, the “grey” areas, and bring a better understanding to the world’s more complex systems (for better or worse), and with a few strokes of a keyboard, and a couple of images, you could do the same with your students to help bring visual clarity to more complicated understandings (the importance of quarks in particle physics, Shakespeare’s use of meter to convey feeling, or why estimation is such an important skill). Perhaps I’m stretching this idea a bit thin, but for good measure I’ll attempt an actual example. What if J.J. Thomson, the man who discovered the electron, had been able to command a platform as big as TED and the internet to spread his idea? Would it have looked like this? 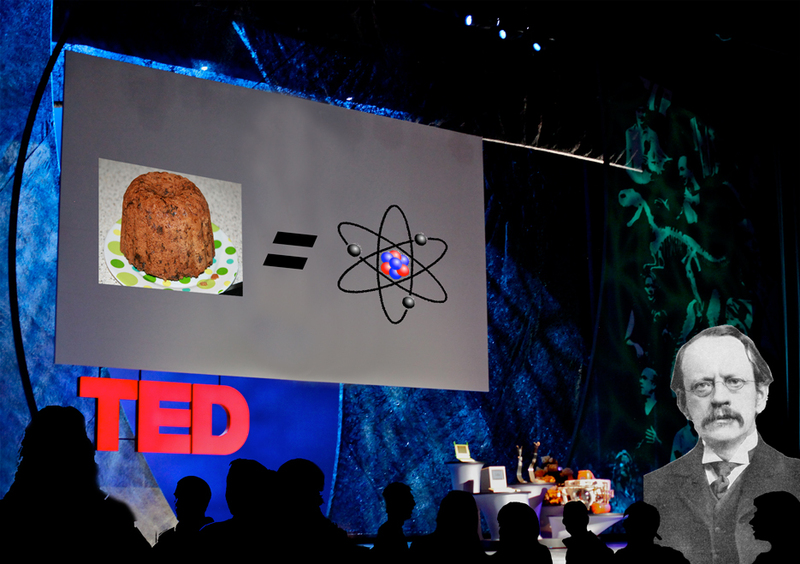 His idea of the “plum pudding model” for how atoms worked was flawed, but followed the basic format of a TED presentation in that it took something terribly complex (particle physics), and tried to apply common place understanding to how it worked in an attempt to better understand how the world works. 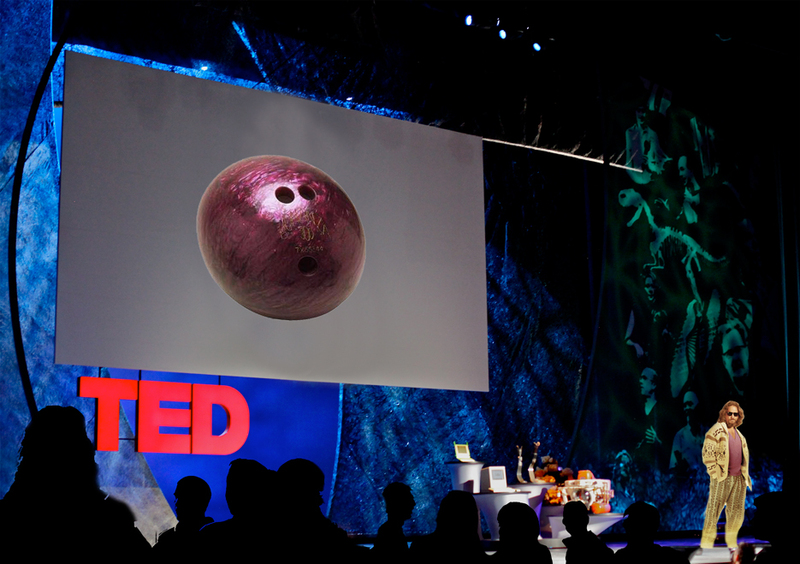 If you’re interested in creating your own Fantasy TED Talks with your students, or just one for yourself because you happen to be geeky enough to want to try it out, you can download a PSD format file that includes the template I created with the stage, a blank screen, and the crowd looking on eagerly. This is amazing Ben. What a perfect ds106 assignment. As I will be asking my students to investigate some of the pioneering figures in internet history this next semester, how awesome it will be to suggest that they go for this Fantasy TED Talk. Thank you. Awesome idea! There’s a lot of internet “founding fathers” that you could use from the ARPANET days, or maybe even do an Al Gore spoof showing just how he created the internet. Can’t wait to see what your students create and who they use! I’d actually be very interested in Vint Cerf, as he literally just made news in his New York Times Op-Ed about how access to the internet IS NOT a human right (http://www.nytimes.com/2012/01/05/opinion/internet-access-is-not-a-human-right.html). Absolutely brilliant, Ben! Wow, the wisdom I’d be soaking up out in the audience listening to the DUDE tell how it is on Fantasy TED. Or, imagine taking notes during Al Gore’s discourse about his Internet discovery, and quite possibly using the class’s emerging crap filter to sift through the layers of concocted media bloat to give Mr. Gore any credit where it may be long overdue. Very cool and inspiring assignment indeed! Thanks for sharing it. This is an awesome assignment, and I finally have a good idea for one. You rock!